PBDE, pesticides, BPA, PFOA…it’s pretty scary what is in our bodily fluids these days, and children are especially at risk from these toxins. 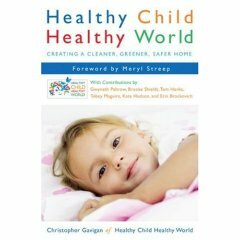 Healthy Child Healthy World is a great resource to help parents learn how to live a simpler, greener life. The format is user friendly, and the appendix includes an extensive list of “Healthy Resources”. If you are wondering how to create a healthy lifestyle and non-toxic environment for your family, this book is right for you. I produce a cloth shopping bag made out or repurposed textiles, by women who are recently recovering from domestic violence. It is a very small company but very green. The bags can be washed, so they don’t harbor bacteria, and are fully biodegradable and compostable. If you would like to see the bags go to http://www.lieberdesigns.com. You can call me to oder one. 760 415-1953. They are all one-0f-a-kind since they are made from remnants.